It’s very likely that I’ll be putting together a guide for a distributed deployment of WAP in the not too distant future. A distributed deployment would have its privileged roles on a backend network with its publically available roles on separate servers located in a DMZ, but that’s out of scope for this particular guide. With no further ado, let’s get to it. 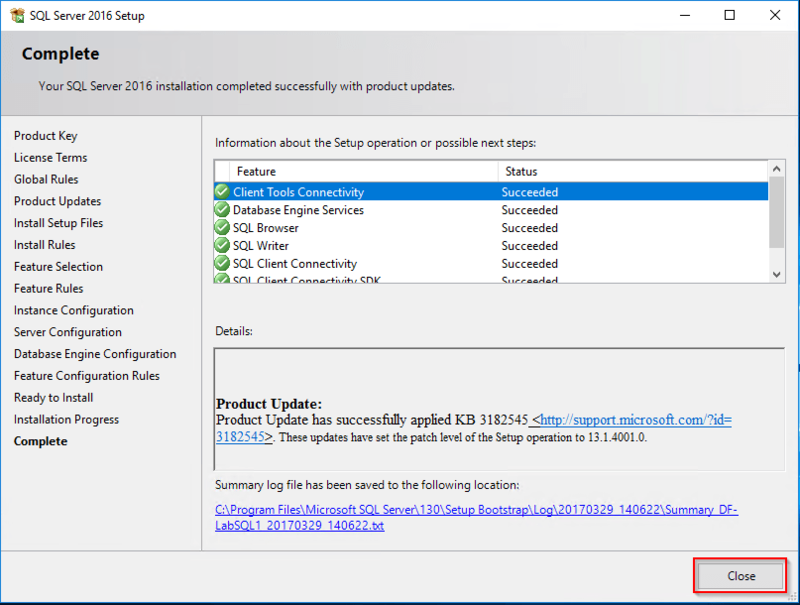 There are a few pieces of software you’ll need before we get going, some of the links I’ve provided are to evaluation ISOs, substitute these with your own as you see fit. 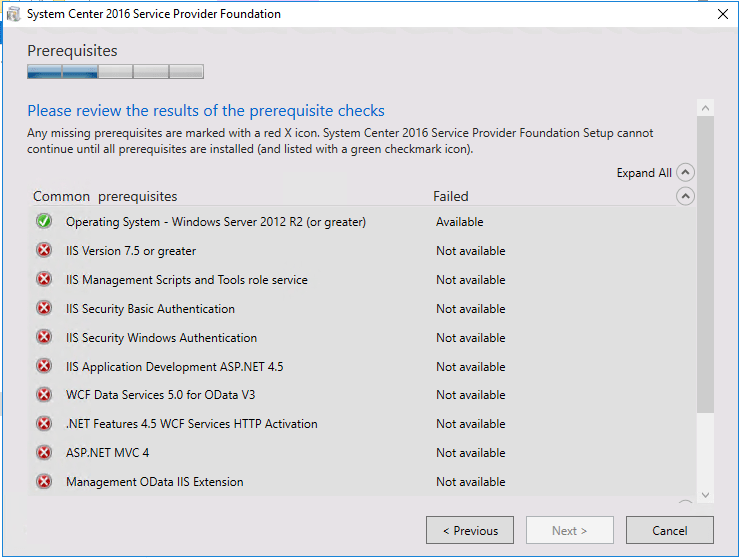 These servers should be fully patched and joined to your management domain. 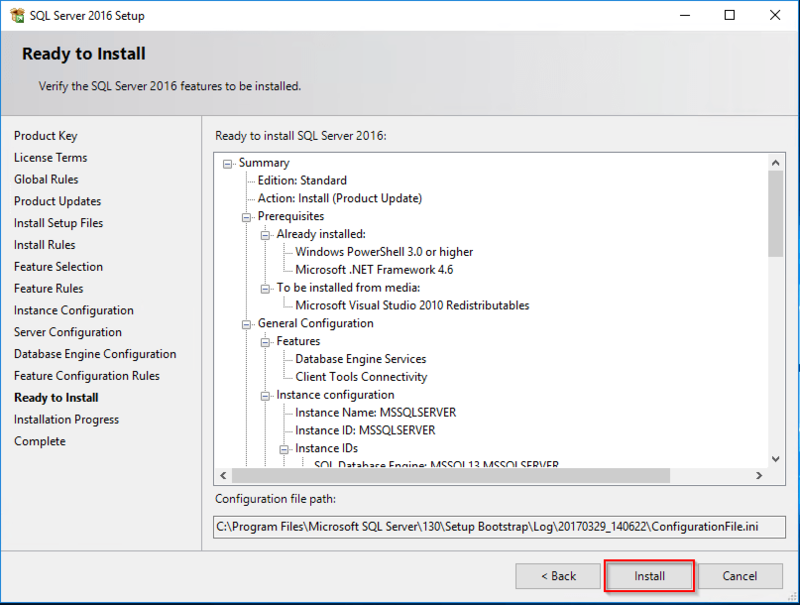 Log onto the SQL VM you deployed earlier, mount your SQL 2016 ISO (downloaded above or using your own) and run “Setup.exe”. 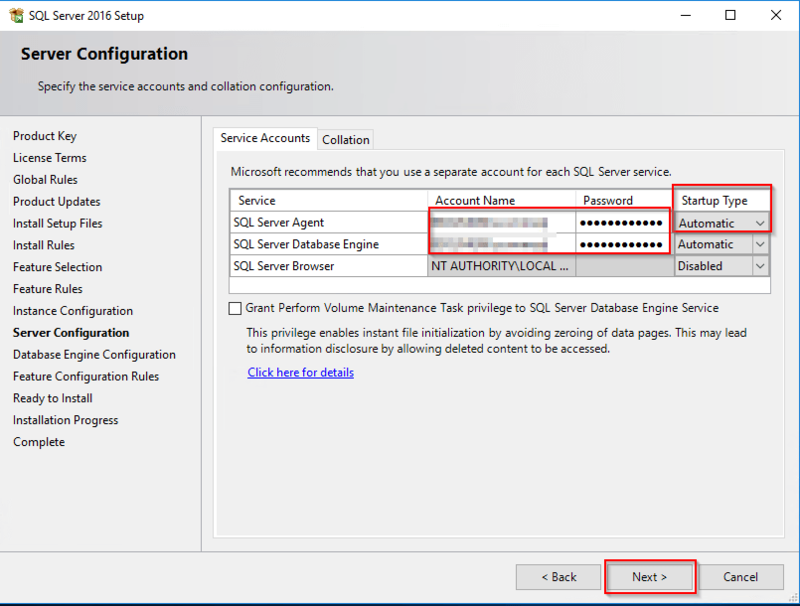 On the “Server Configuration” screen, enter the SQL Service account you created earlier under “SQL Server Agent” and “SQL Server Database Engine”. 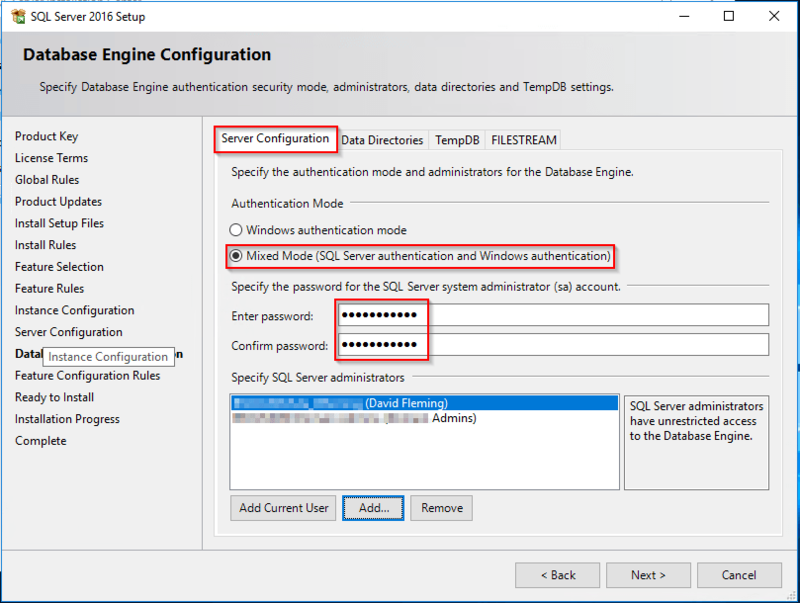 Select “Mixed Mode” as the Authentication mode and enter a password for the “SQL Server system administrator account (SA)”. 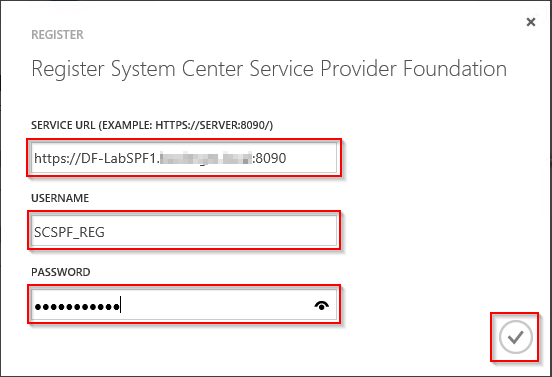 Note this password down as you’ll need it during your WAP deployment. 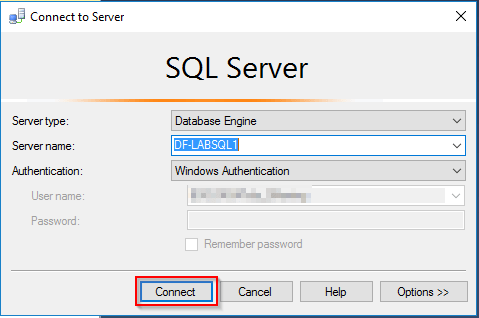 Click “Add Current User” and add any additional users you want as administrators on this SQL instance. 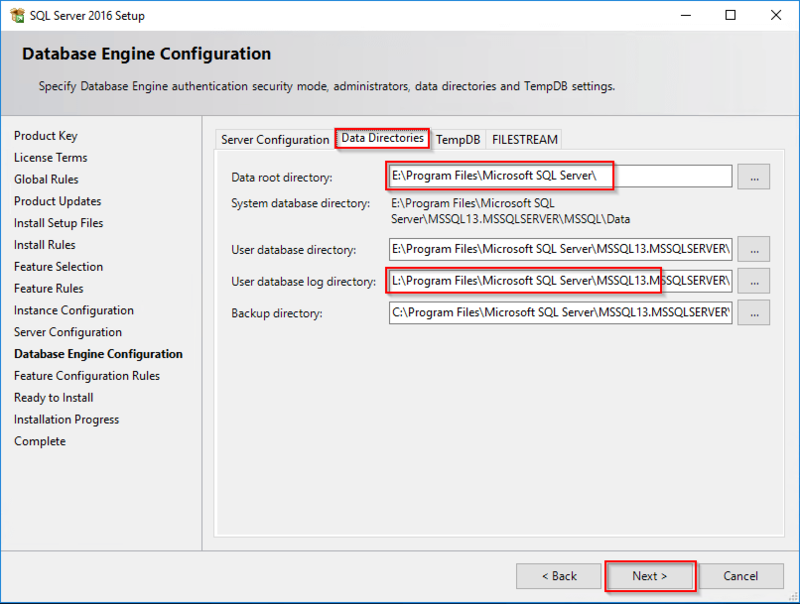 Before moving on though, you’re going to want install SQL Management Studio as we’ll need it later in this guide. 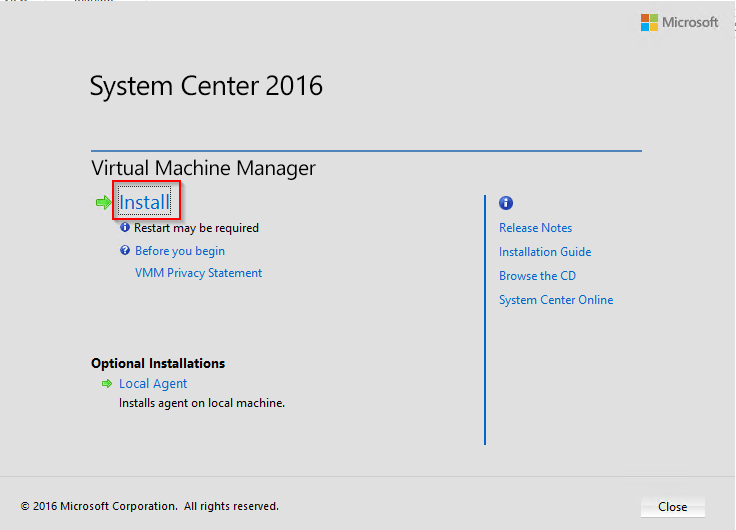 You can download the installer by clicking the link in the prerequisites section at the TOP of this guide. 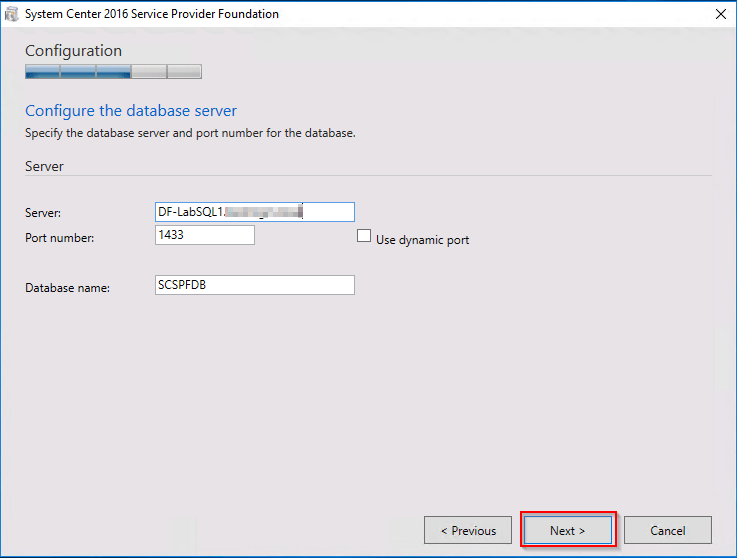 Now that we’ve got our SQL server up and running, we can move on to deploying our SPF server. 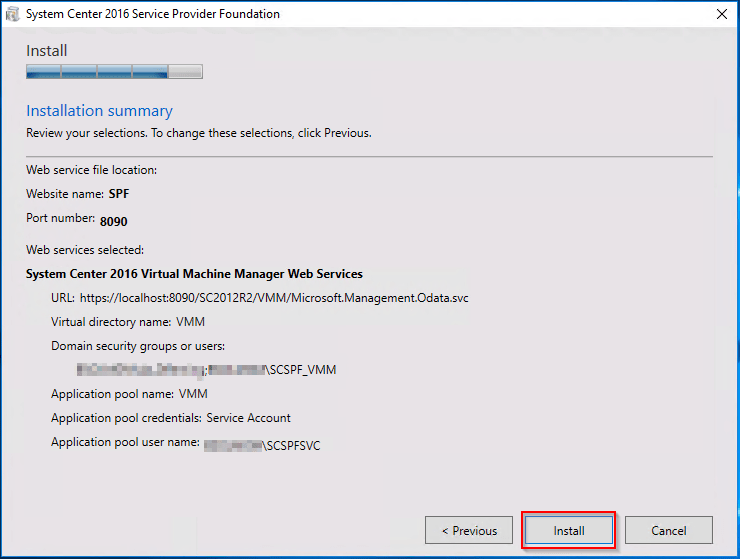 Log onto the SPF VM you deployed earlier and mount the Orchestrator ISO you download above in the prerequisites section (or use your own). 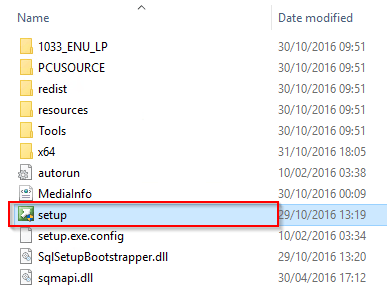 Run the “SC2016_SCO” application to extract the files to a location of your choice. OK, so let’s turn all those red crosses into green ticks. 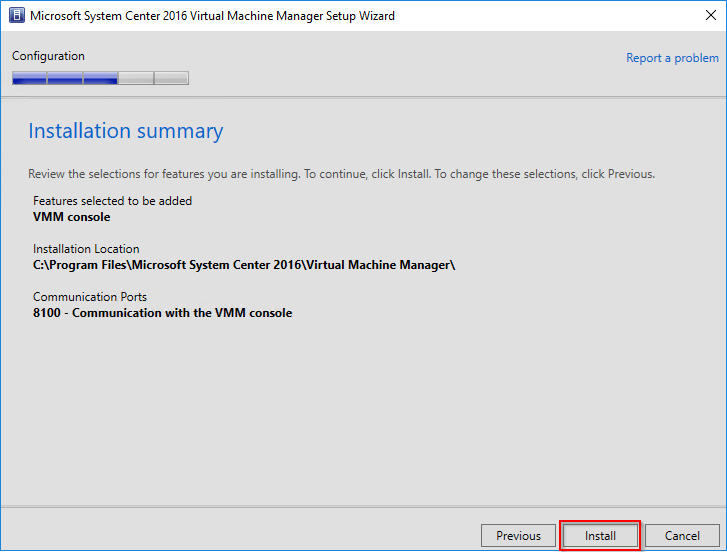 Mount the SCVMM ISO you download above in the prerequisites section (or use your own). 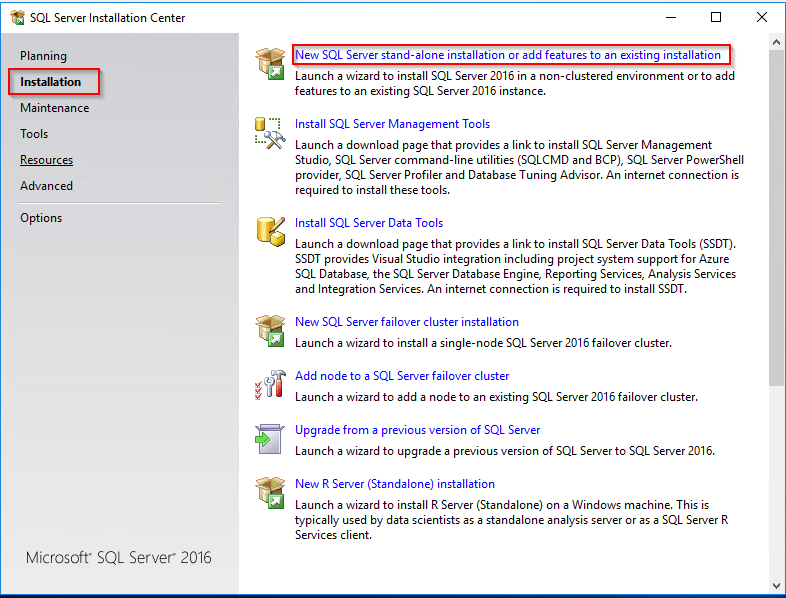 Run the “SC2016_SCVMM” application to extract the files to a location of your choice. 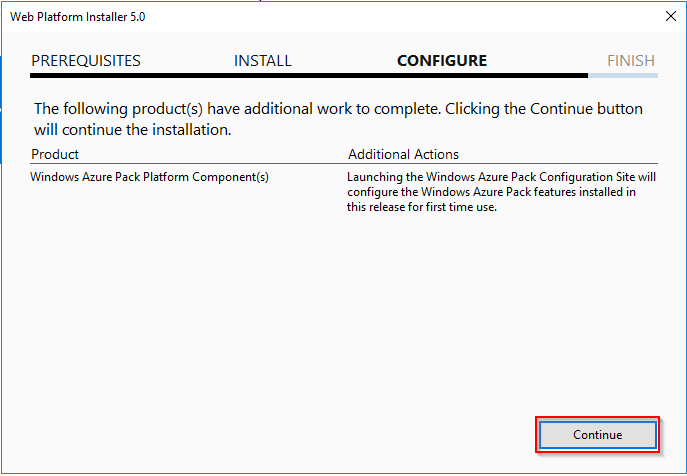 Once the installer has completed, click “Close” twice. 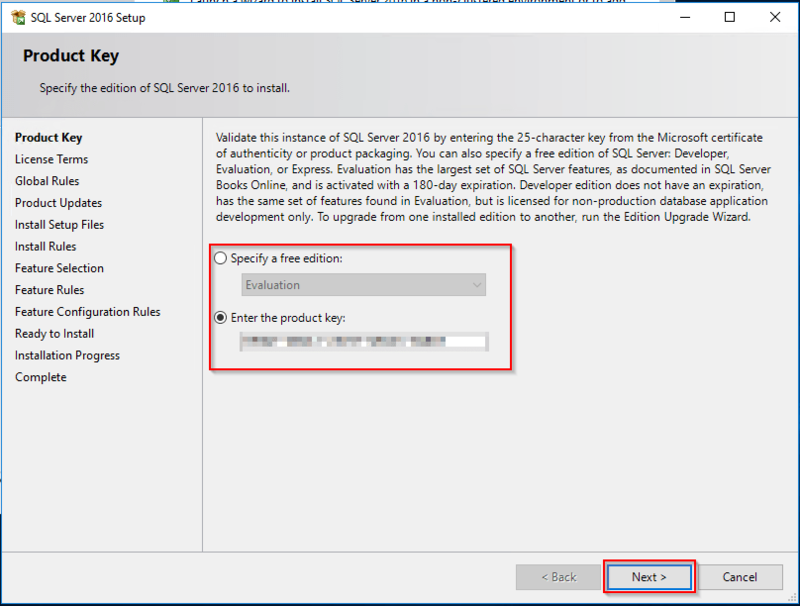 Enter the FQDN of the SQL server you created earlier. 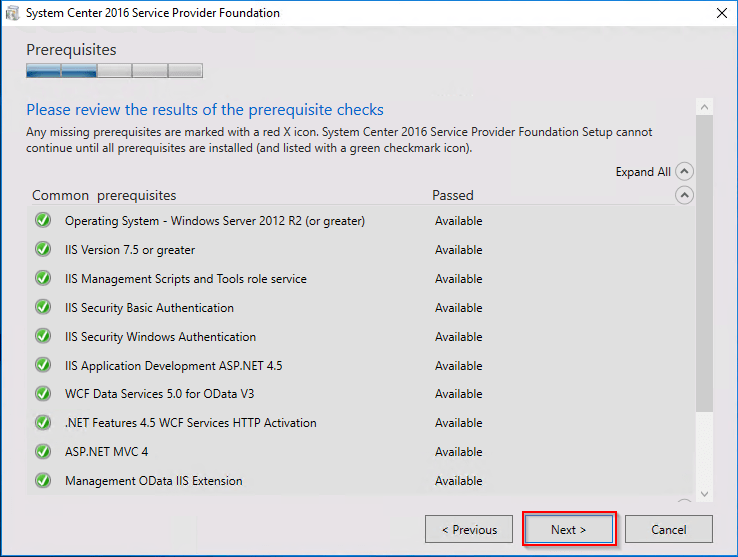 Under “Server Certificate” select “Self-Signed” if you’re building this environment for testing purposes or select “Use Existing Certificate” and provide a certificate from a trusted Certification Authority. 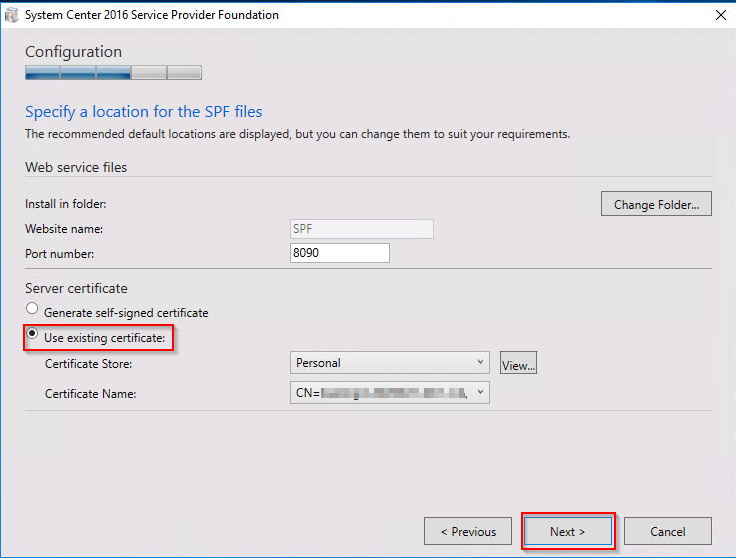 This certificate is used by SPF as for its IIS site bindings. 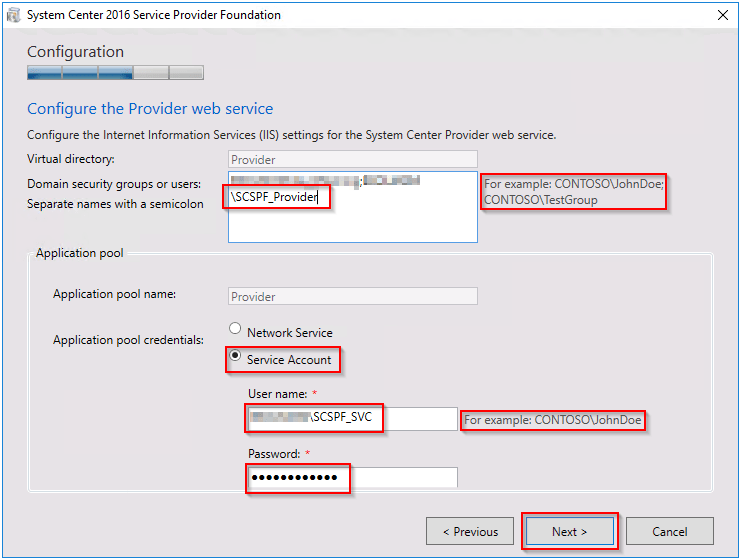 On “Configure the Admin web service”, enter the security group you created earlier for “SPF Admins” (See required layout in screenshot). I used the same security group for both the “VMM” and “Usage” web services. 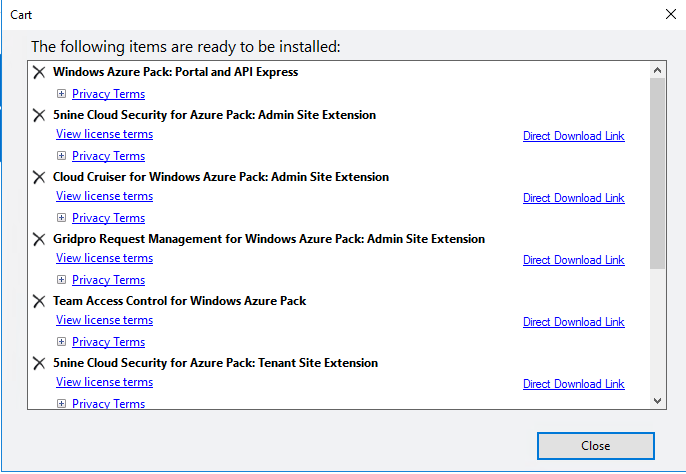 Before moving on to our WAP deployment there are a few things left to do, the first one is to sort out our local permissions. 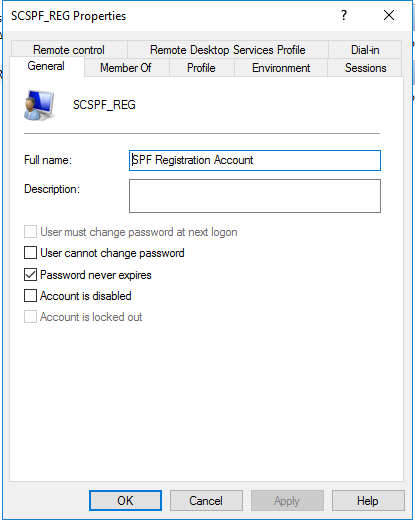 We also need to add the SPF Service account to the “Administrator” user role in the SCVMM console. 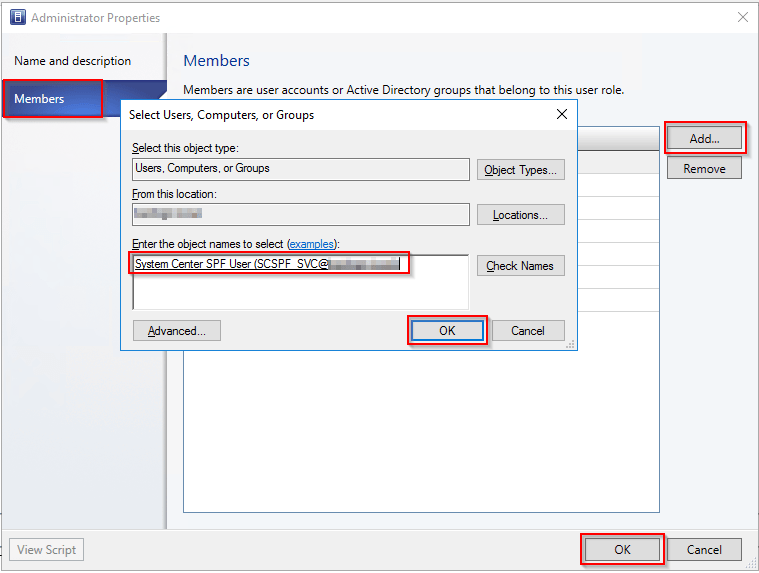 On the “Members” tab, click “Add” and search for the domain SPF Service account you created earlier in this guide and click “OK” twice. 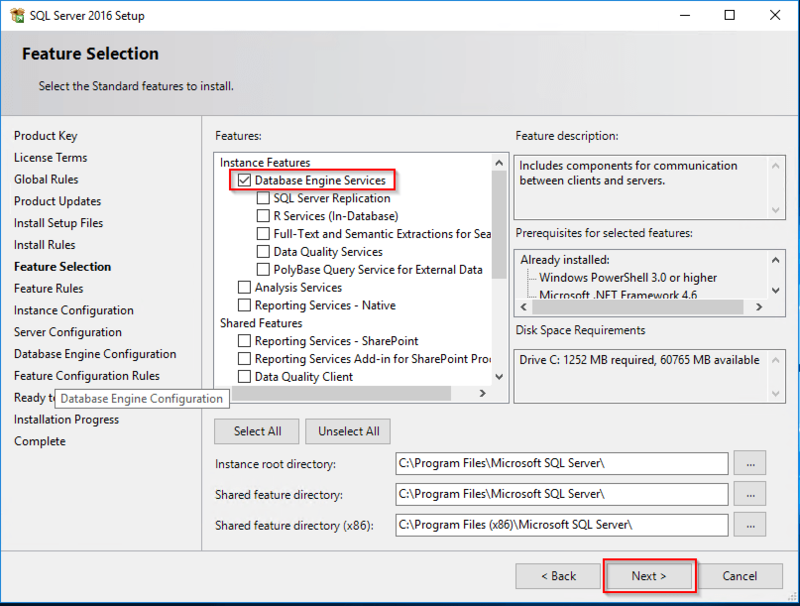 The last thing we need to do is to make sure the domain SPF Service account has the “Sysadmin” server role on our SQL server. 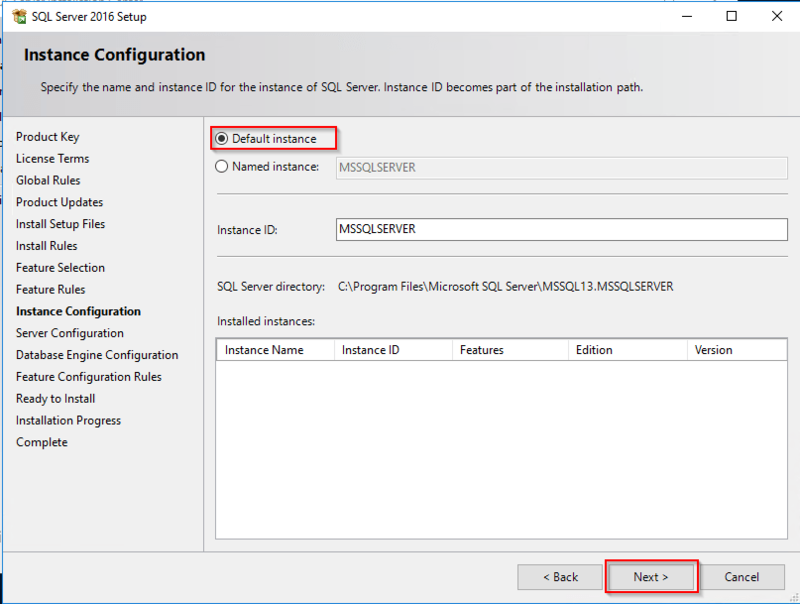 Log onto your SQL server and launch “Microsoft SQL Server Management Studio” and connect to your instance. 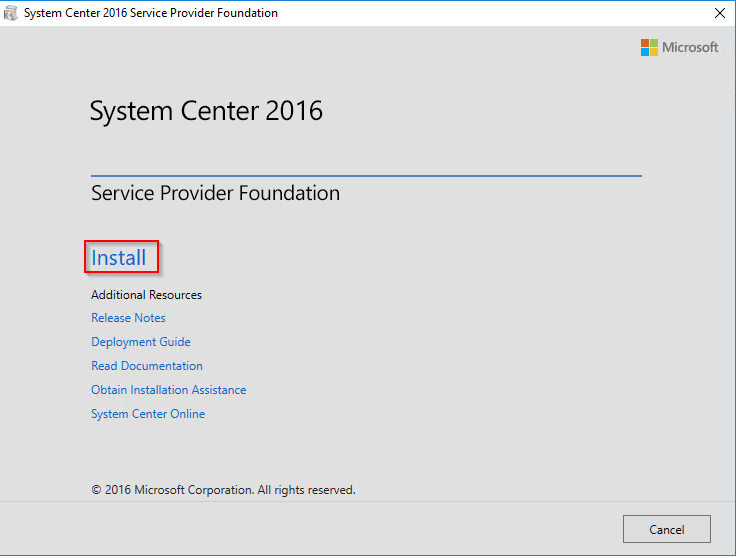 Being that we’re installing WAP as a single server deployment (Express), we can make use of a great tool that Microsoft put out that’ll do most of the work for us. 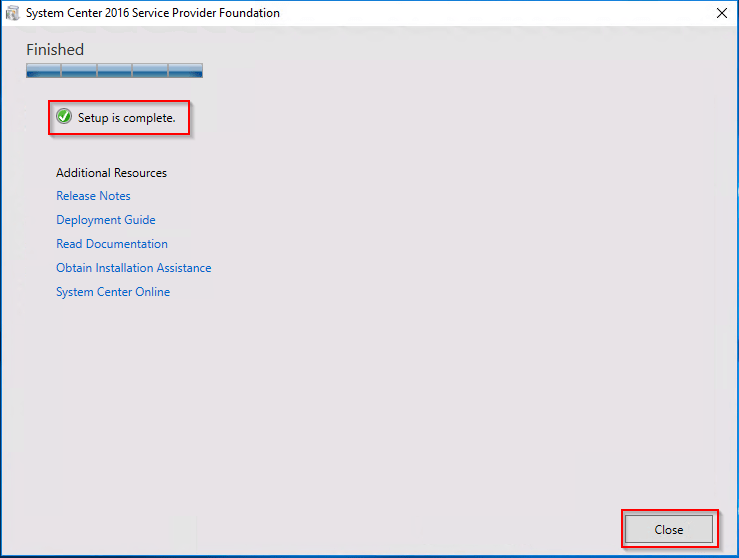 You should have already downloaded this file to your WAP server as per our prerequisites. 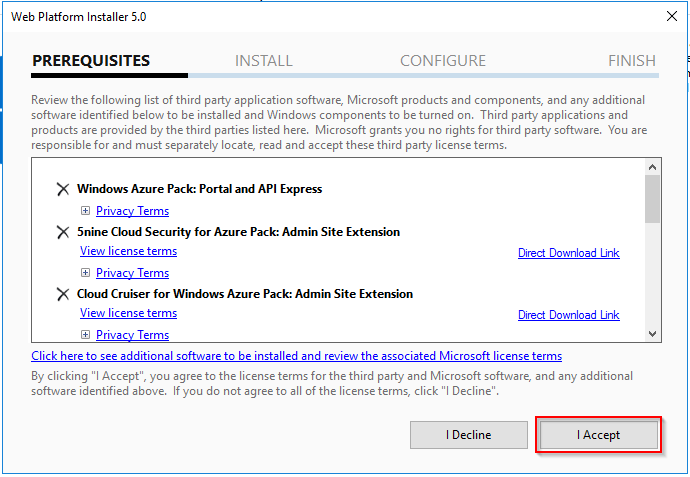 Now click “Install” and accept the terms. 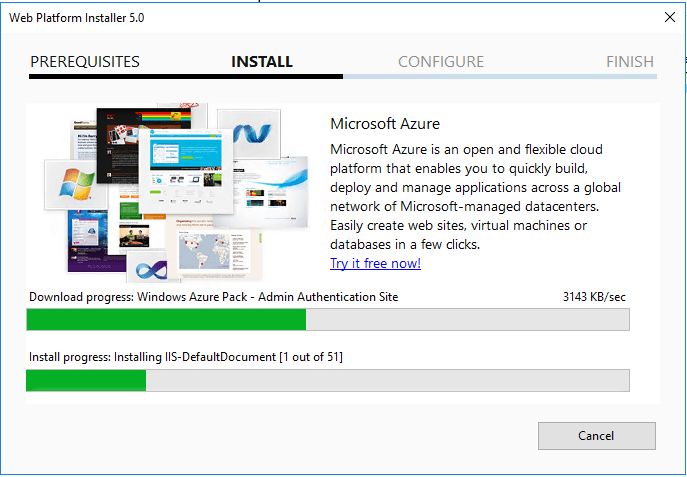 All components will now be downloaded and installed, this may take a while as there are 51 steps in total. 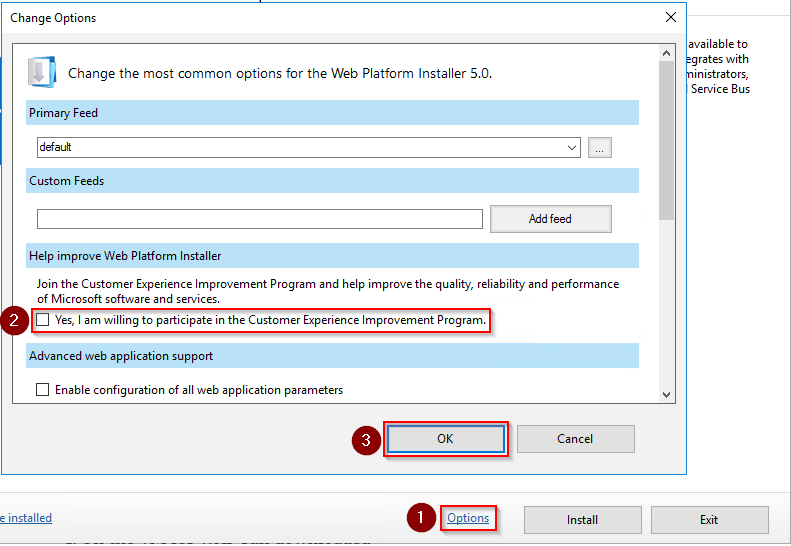 When the installer has finished, click “Continue” to launch the WAP configuration site. 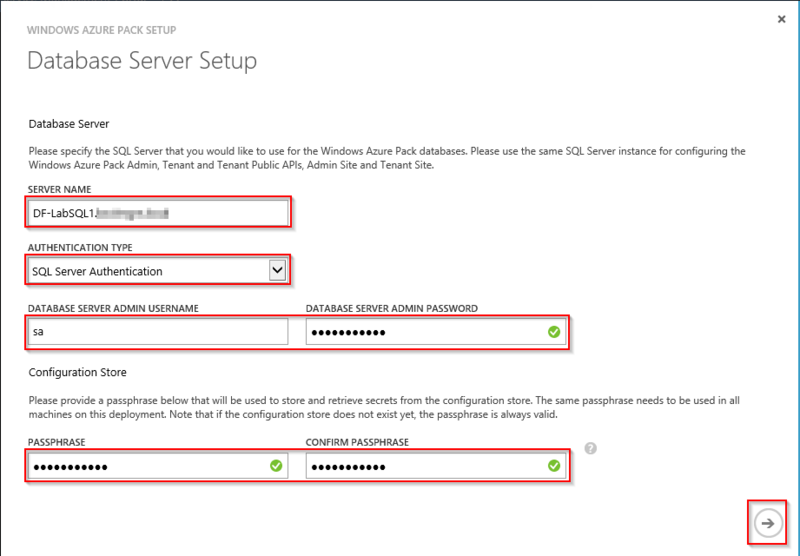 Enter a passphrase for your configuration store (See details in screenshot for what this is used for). Now click the next arrow. Once all items have a green tick next to them, click the “tick” again and the window will be closed. 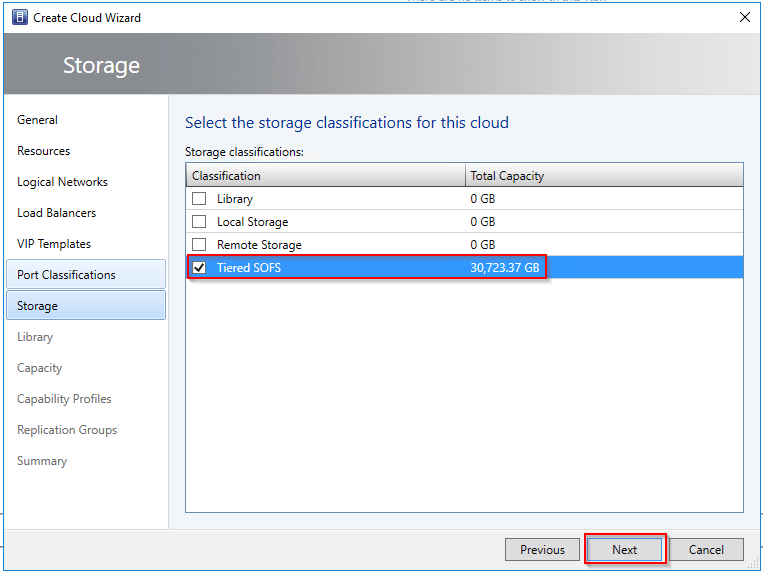 Fantastic, now that we’ve deployed SQL, SPF and WAP, let’s get it connected up to our compute and storage resources via SCVMM. 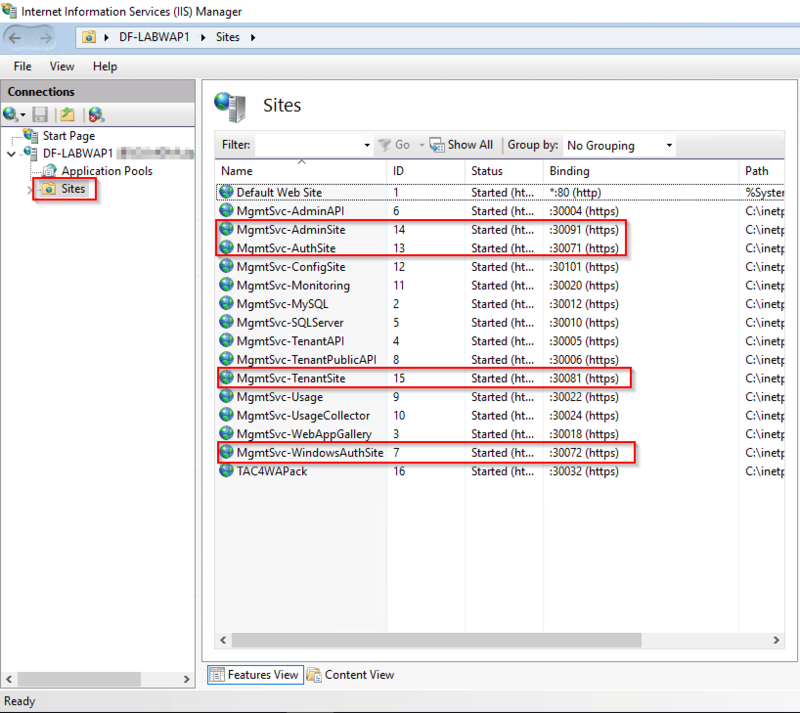 The first thing you’ll notice are the port numbers that have been used, don’t worry, these can all be set to port 443 and can be configured to use an SSL certificate that’s been issued by a trusted Certification Authority. See my guide HERE on how to do that. 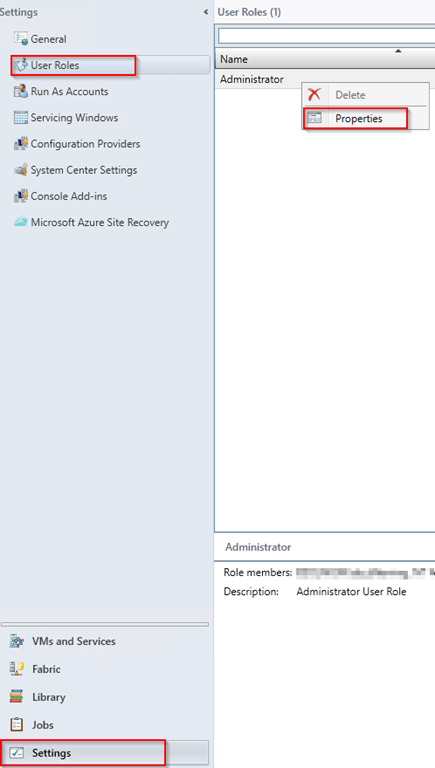 Now that we know the port numbers we can log into the WAP Admin portal and start to configure these resources for use. 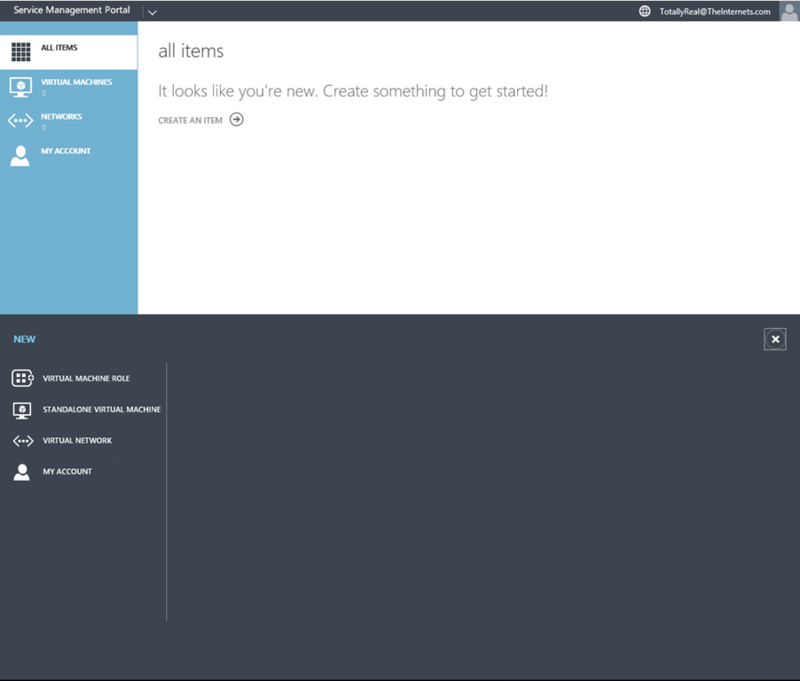 Before we do that though, let’s go and create a cloud within the SCVMM console. 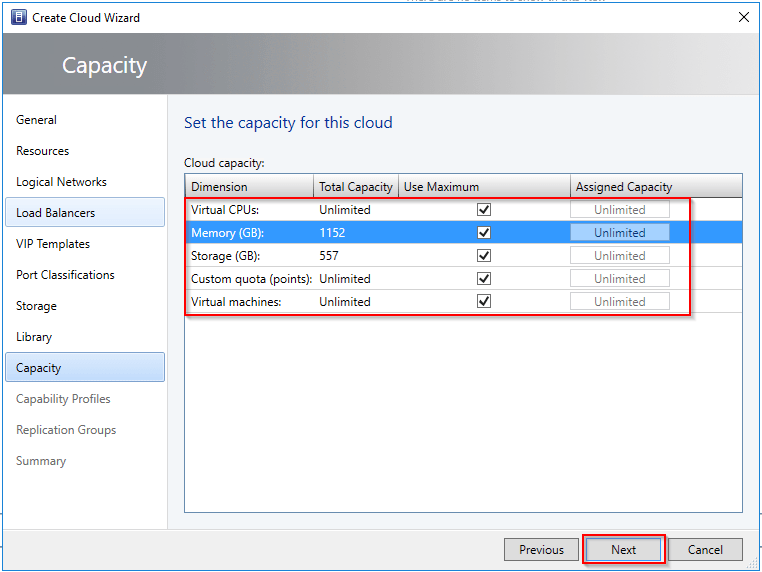 Type a name for your cloud and if you’ve been following my Server 2016 Features Series, select “Supported on this private cloud” from the “Shielded VM support” drop-down. 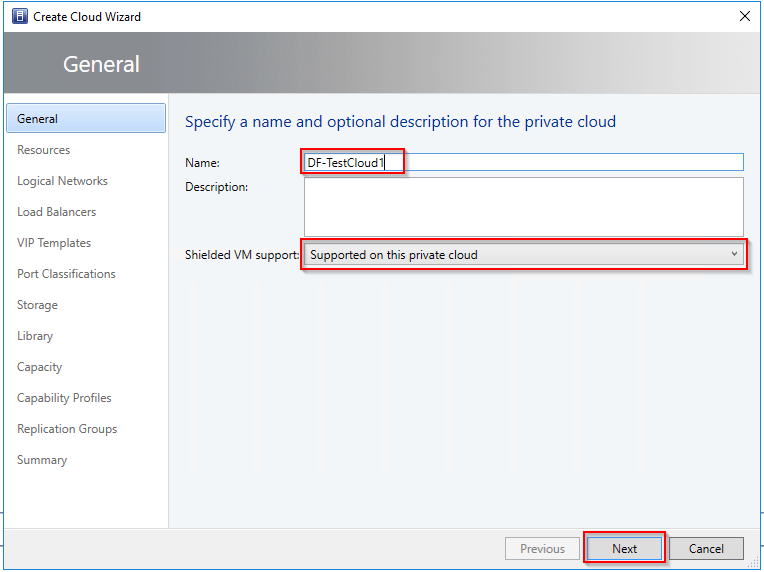 Otherwise select “Not supported on this private cloud” if you’ve not deployed a guarded fabric. 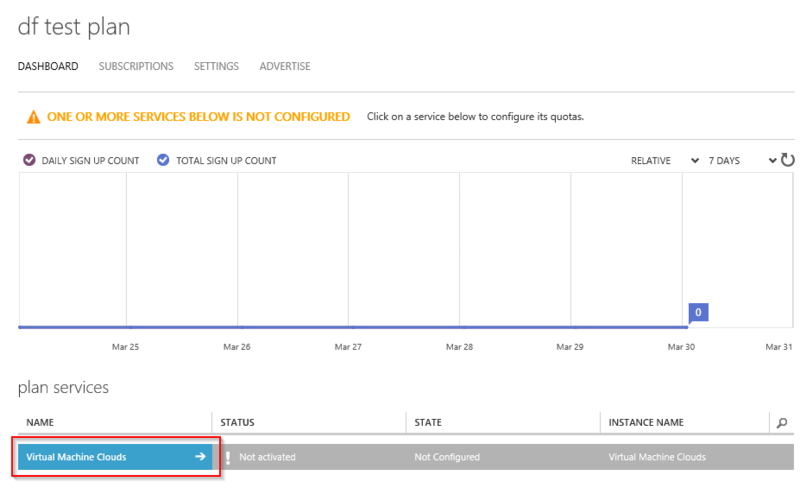 Skip the “Load Balancers”, “VIP Templates” and “Port Classifications” tabs for the time being. 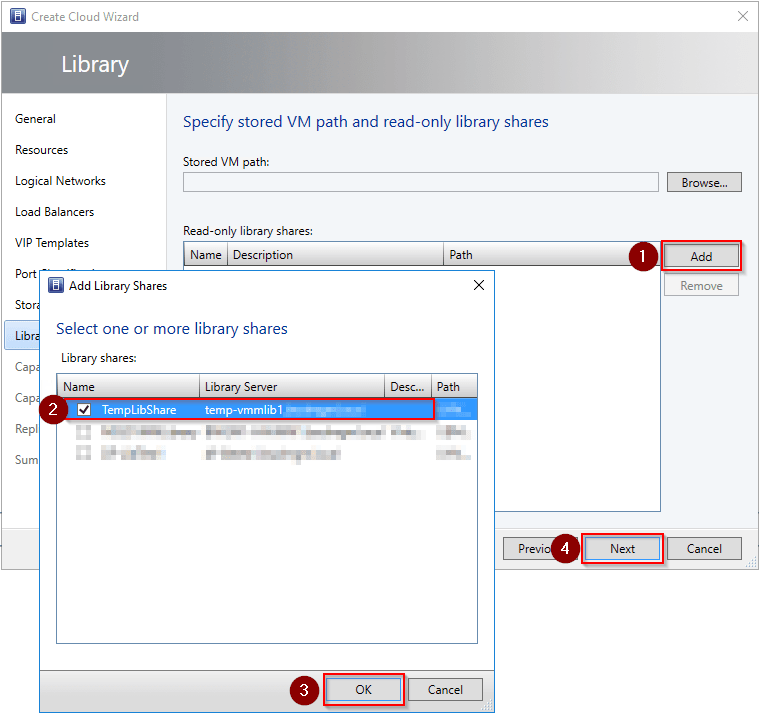 Under “Read-only library shares” click “Add” and select a library share to attach to your cloud. 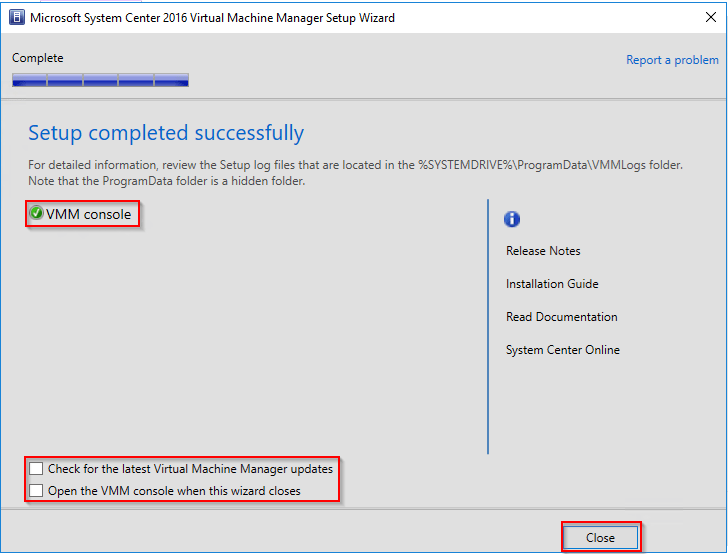 This is especially imported if you’re going to configure Shielded VMs as it’s a requirement when downloading the Volume Signature Catalogue for signed template disks. 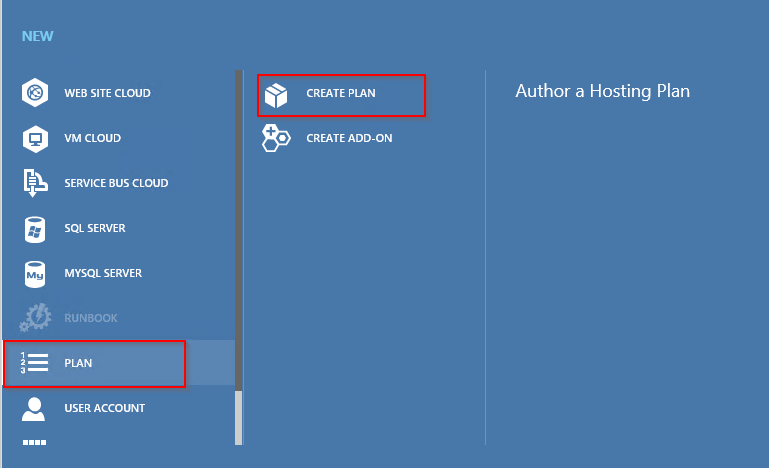 Back on your WAP server, launch the WAP admin portal by browsing to the following URL: https://localhost:30091 and log in using the account you used to deploy WAP (additional admin users can be added to the WAP admin group. See my guide HERE on how to do that. 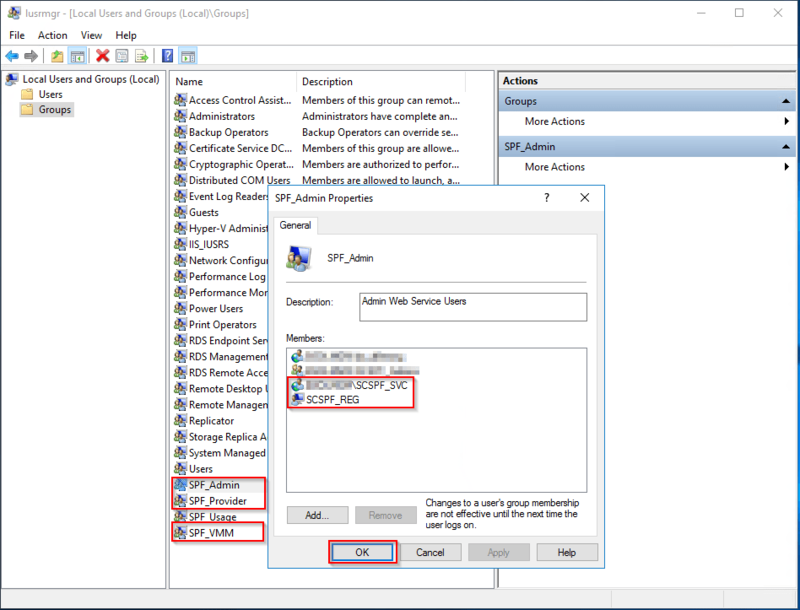 With WAP connected to SPF, we should now be able to connect WAP to our SCVMM Server. 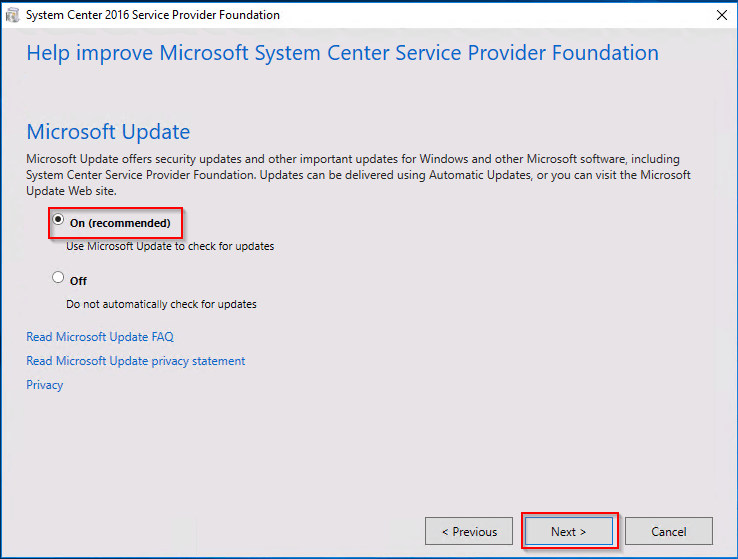 Now that you’ve got everything up and running, you’ll want to make sure that everything is working as expected. To assist with that, lets create a plan and a tenant to add to that plan. 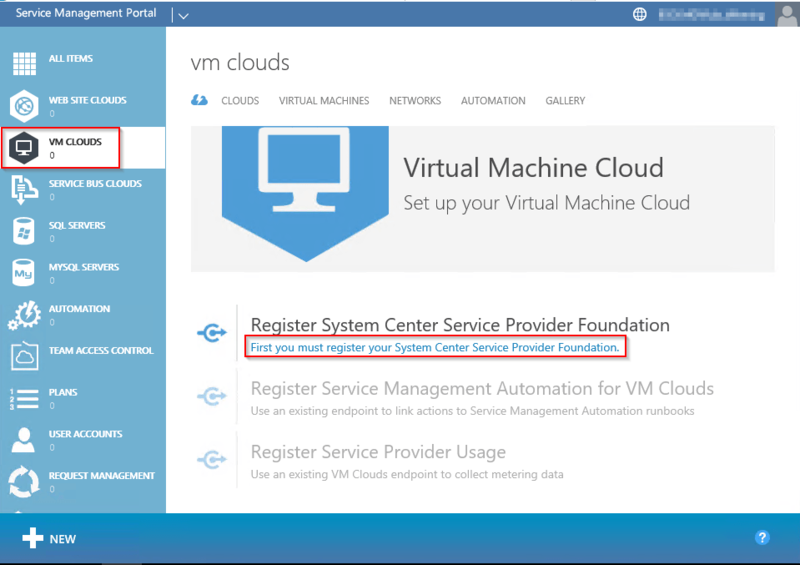 Place a tick in “VIRTUAL MACHINE CLOUDS”, click the “right” arrow and the “tick” to complete. 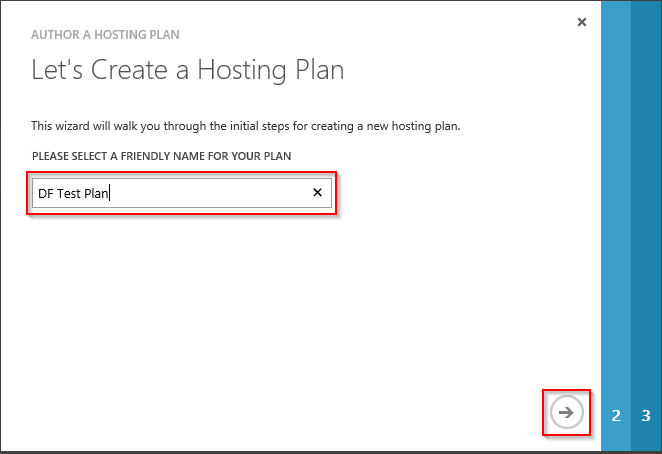 So we’ve now created a plan but need to configure it. 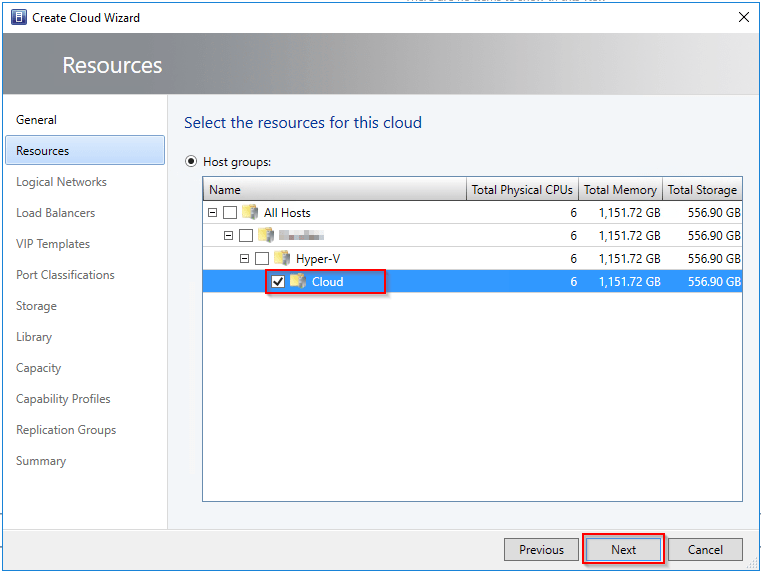 This will let us chop up our available resource, assign specific VM networks and templates etc. 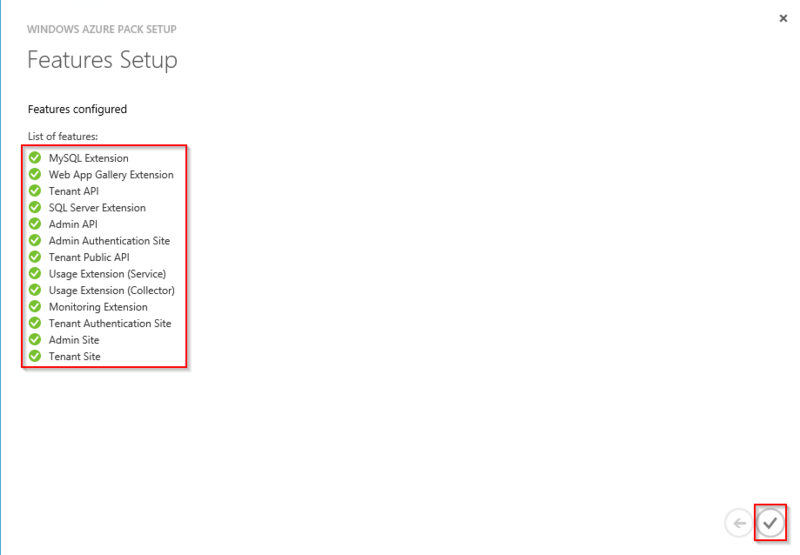 Click on the plan you just created to view it’s properties. 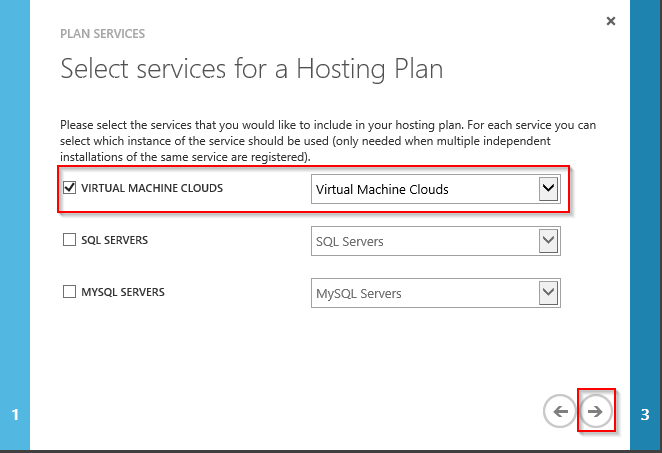 Within the plan properties, click on the “Virtual Machine Clouds” link. 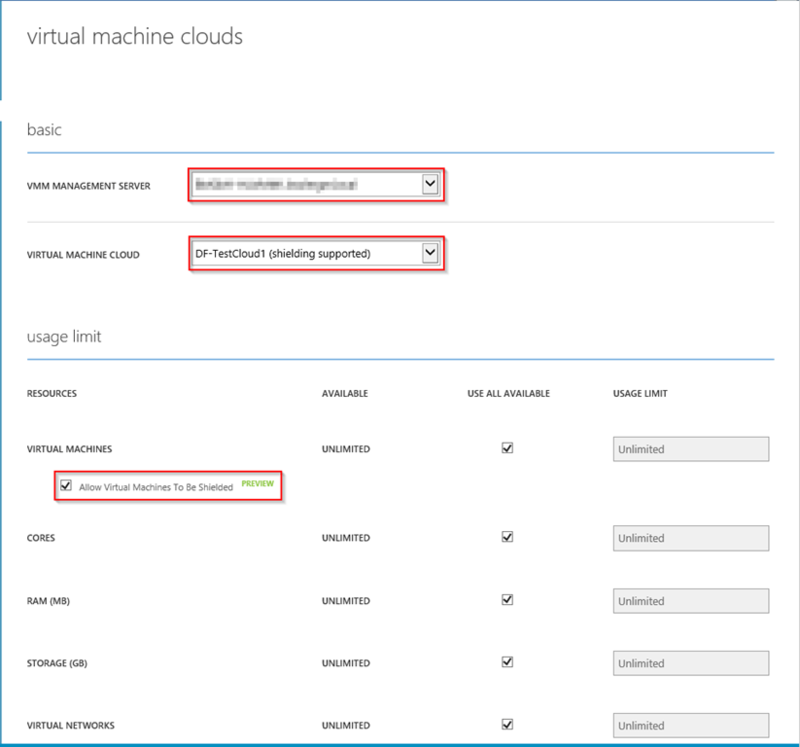 Also, if you’ve used my Server 2016 Features Series to deploy a Guarded Fabric, you’ll notice that shielded VMs are supported on this cloud. 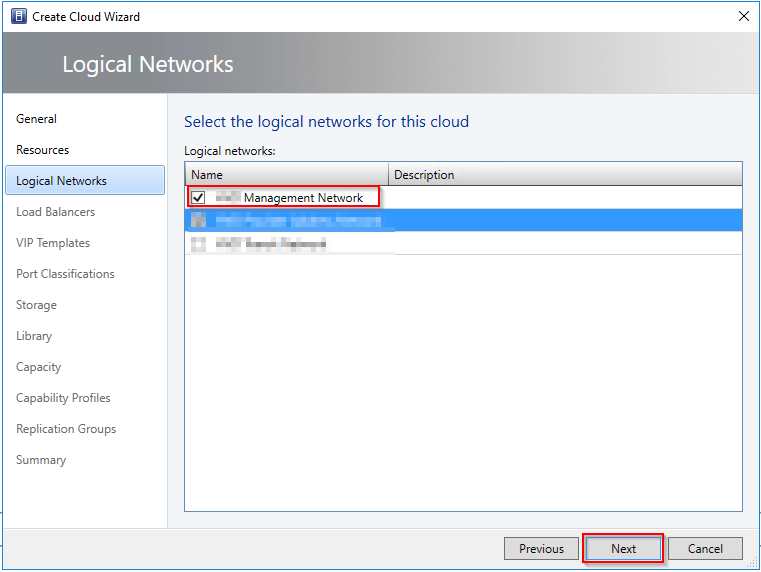 Within this page you can choose how much of your available resource to allocate to this plan, you can also choose which networks, hardware profiles and templates to assign. 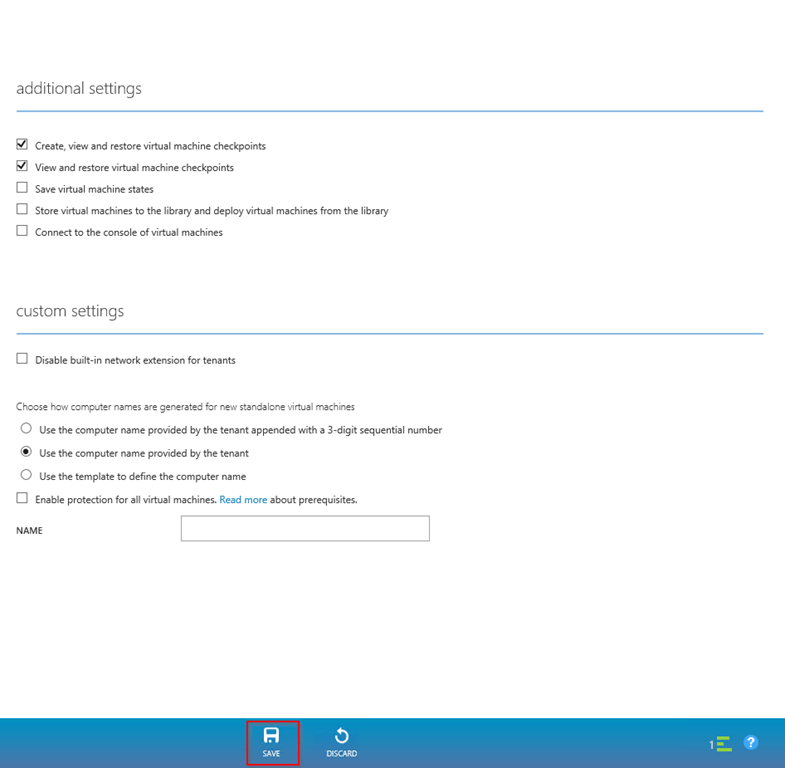 Also take a look at the “additional settings” section (choose whatever settings work for you) before clicking “Save” to finish configuring your plan. OK, now that we have a plan, let’s create a tenant and given them access to it. 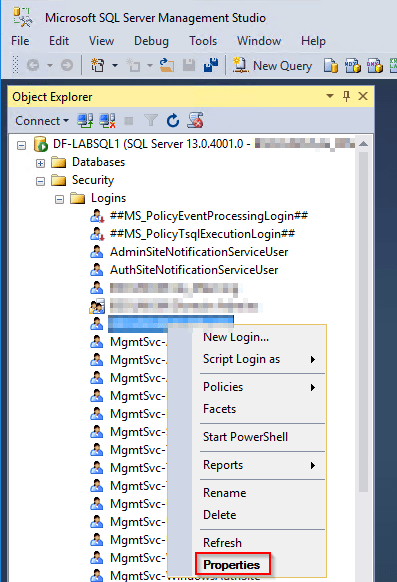 Now, let’s log into the tenant portal as the user you just created. 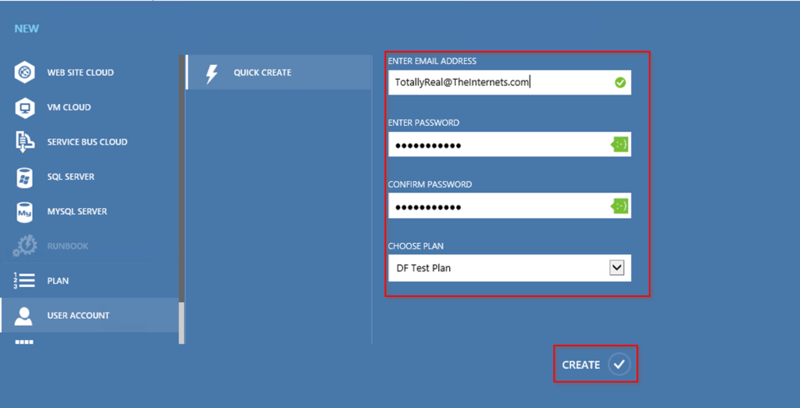 On your WAP server, browse to: https://localhost:30081 and login as the user we just created. 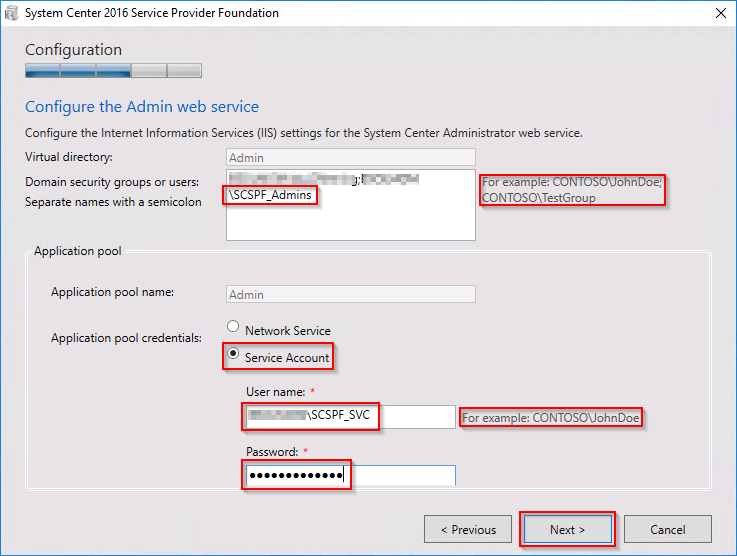 I got the the stage of add the SPF Service account to the “Administrator” user role in the SCVMM console, but I am unable to log into the SCVMM console as my account is not a member of a valid user role. Any thoughts as to what I need to do now? 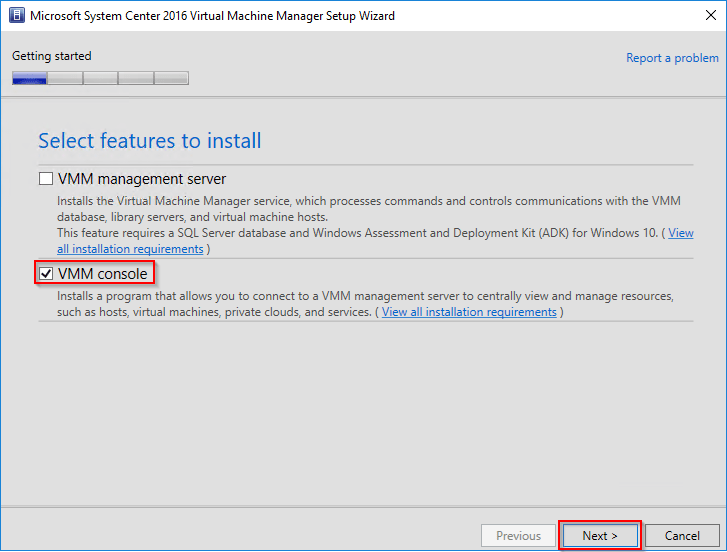 The only real way round this is to log onto the SCVMM console as a user that IS a member of a valid user role. 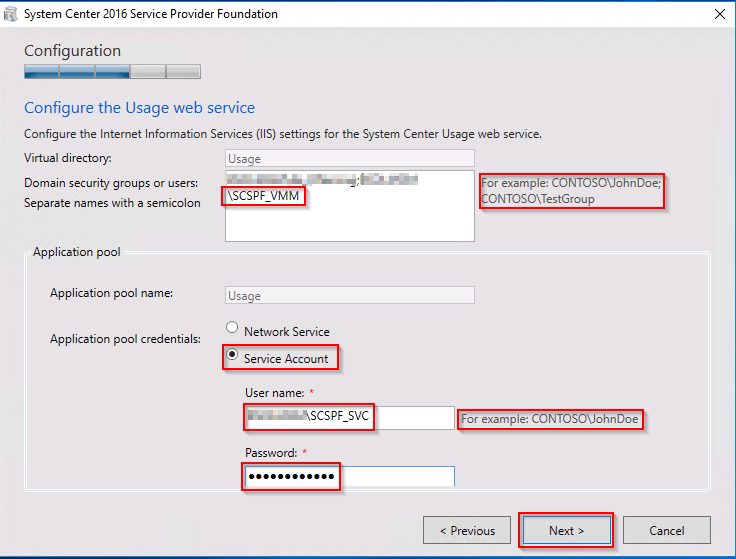 Are you trying to log onto the SCVMM console AS the SPF Service Account? 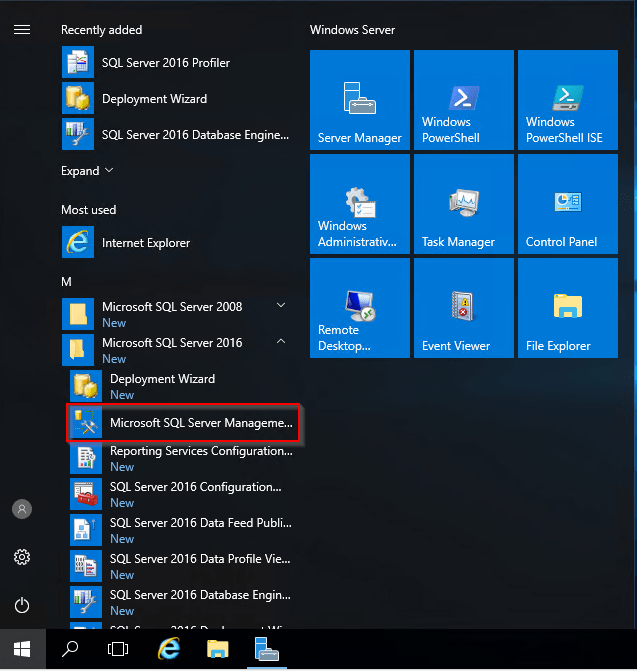 Quickest fix would be to have a SCVMM administrator jump on and add the account for you. Thanks a million for doing such a great job with providing this awesome doc ! I followed it exactly and worked like a charm the first time :). 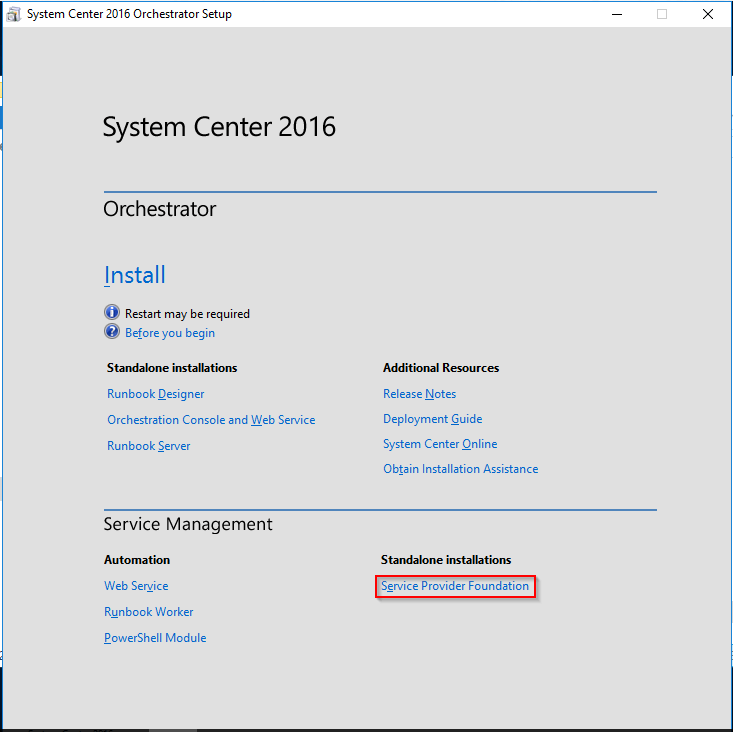 Did you provide other posts where you show how to configure the services ? I am particularly interested in Server Roles. If not, can you provide a site or resource where I can learn this? Again, great job ! 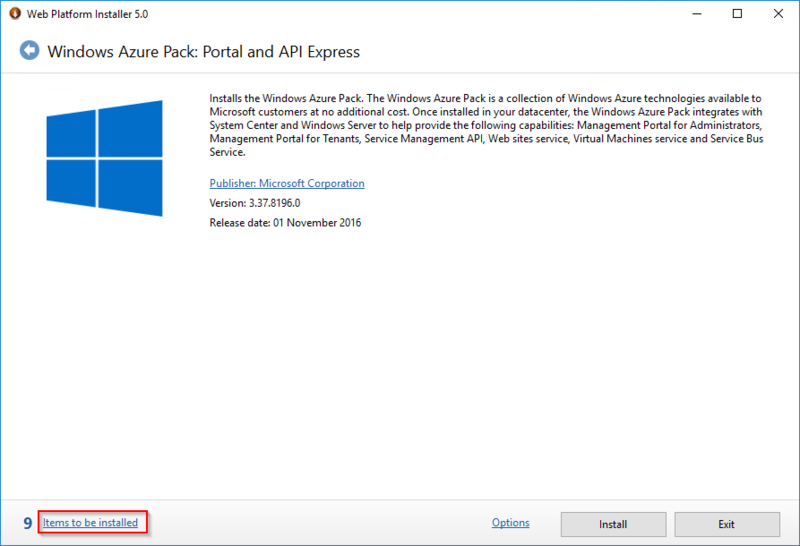 I’ve only ever done one distributed deployment of Azure pack and if I remember correctly I used the following article for guidance. Hope this helps, good luck Mike. Thank you for so much this awesome step by step guide! 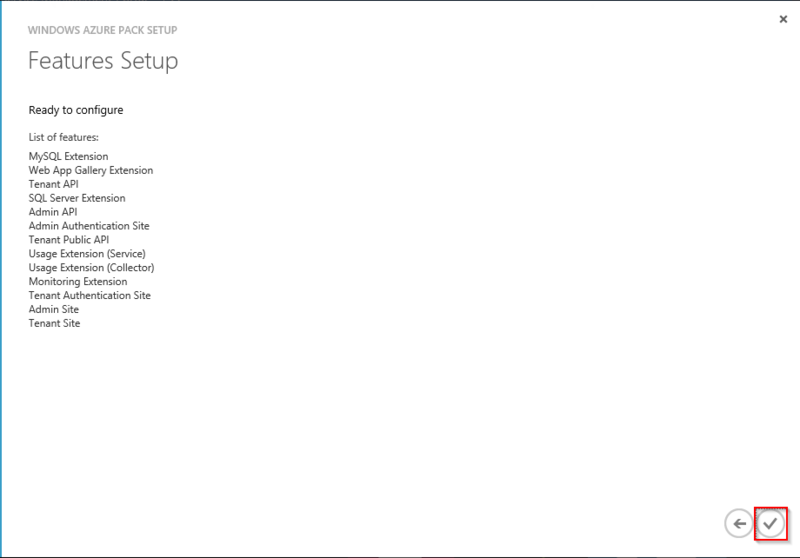 I wasted 2 hours diving through Technet just trying to get the SPF details before giving up and going to google. That’s great to hear, thank you very much. This doc is awesome, just wanted to let you know!